PRESS RELEASE: Drum Workshop Inc., the award winning, California-based drum manufacturer for nearly 40 years recently announced the addition of a professional-quality, mid-priced production drumset to its already celebrated line of custom-built DW branded drum kits. The new series features a proprietary drum shell called HVX, referring to its grain orientation made up of horizontal, vertical and diagonal plies. The 8-ply all-maple shells, made from hand-selected North American Hard Rock Maple, are said to provide a low-mid frequency range with plenty of punch, articulation and are perfect for a wide variety of musical applications. Drum Workshop executive Vice President and Drum Designer, John Good, explains, "We really wanted this kit to sing, and at the same time, have a sound all its own." "This shell wouldn't have been possible without the past several years of research and development under our belts. Shon Smith, from our custom shell shop, and I really worked hard to change the way that drums have been made for decades. This new technology allows drummers to really get into the subtleties of the instrument in terms of tuning range." "These new Performance Series drums are no one-trick-pony, they can do it all." In addition to a brand new shell design, Performance Series drums also feature a new look courtesy of scaled-down version of DW's trademark turret lug, called a Quarter Lug. The snare drum even features a completely new dual-mini turret lug. The snare also features DW's new MAG drop throw-off and heavy-gauge flanged steel counter hoops. The entire set comes equipped with graduated counter hoops: 8" and 10" are 1.6mm, 12" to 16" are 2.3mm and the 14" snare drum is 3mm. Other professional grade features include, True Pitch Tension Rods, STM (Suspension Tom Mounts), low mass die cast claw hooks, DW heads by Remo U.S.A. and five distinct hand-sprayed lacquer finishes: White Ice, Sapphire Blue, Cherry Stain Lacquer, Ebony Stain Lacquer and Black Mirra. 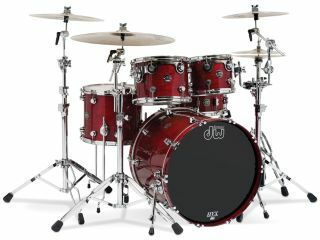 Good continues, "We wanted this to be a kit that more drummers could afford, but we didn't want to cut corners. It's really a challenge to hit a certain price point and not give up on quality or performance. In this case, we really did have to Perform. We included many of the features that you'll find on one of our more expensive Custom Shop sets. I think we've come out with a pro-quality kit that has its own sonic personality and can translate to just about any genre of music today." Performance Series drums are available in two tom packs: 8x10, 9x12, 12x14, 5.5x14" and 9x12, 14x16, 6.5x14". Either can be matched up with a choice of a 16x20, 18x22 or 18x24" bass drum. Available add-ons include: 7x8, 8x10, 12x14, 14x16" toms and 5.5x14 and 6.5x14" snare drums. Retail price for a typical 5-piece set with 10,12,14" toms, 5.5x14" snare and 22" bass is $2999.99.